I like to think it had something to do with our artistic genius – although more likely the magazine had such a small circulation that ours were amongst the only entries – but we both chosen as the winner of our respective age groups. Our pictures were printed in the magazine and prizes sent out, each of us receiving a giant selection box of Cadbury’s chocolate. I’ve mentioned before that the little loaf household was a whole food-focused zone long before it became a twenty-first century trend, where desserts weren’t often eaten and raisins ruled as the sweetest treat around. I’m not trying to make anyone feel sorry for me – we ate incredibly well and my Mum was, and still is, a wonderful cook – but it’s pretty safe to say that the mere sight of so much chocolate to our sweet-deprived eyes was enough to send my brother and I into a state of excitement and imminent hyperactivity. My Mum made a sensible – if not ever-so-slightly sad to my littler loaf self – decision that we should share some of the haul with our friends. A little girl who lived locally had recently broken her arm it was suggested that we pick out our favourite bars from the bunch, then donate the rest to this more needy cause. After endless deliberation, I’m pretty sure I picked out a Fudge (the smallest but, for my money, still the best), a Curly Whirly for it tooth-chewy gooiness and a Crunchie, that incredible combination of sweet caramel honeycomb and melting milk chocolate. I don’t think I’ve eaten many Crunchies since then (scarred for life by the selection box experience? Probably not, more likely I simply began the slow descent towards turning into my more natural foods-focused mother and rarely ever buy a chocolate bar), but on Friday after finishing work for the week I got an urge to have a go at making my own version. The urge turned into a bit of an obsession with ratios and ingredients and five (small) batches later I landed on a recipe with which I’m pretty happy. This recipe puts the honey back into honeycomb, allowing you to create a unique flavour with every batch depending on the honey that you use. Honey is a little sweeter than golden syrup and has a tendency to burn more easily so be careful as you caramelize the liquid, but otherwise you should be good to go. The batch can be halved or doubled, depending how many people you have to feed and is incredible churned into ice cream, crumbled into chocolate biscuit cake or coated in milk chocolate for the original Crunchie experience. Just don’t tell your Mum or she might make you share it around . . .
Line a baking tray with greaseproof paper. If you want a uniform size honeycomb, Ruth Clemens of The Pink Whisk has an ingenious method involving a cereal box here, but on this occasion I was happy for my honeycomb to fall a little more haphazardly. In a high-sided saucepan (you need to allow room for the mixture to bubble up), combine all the ingredients except the bicarbonate of soda over a low heat until the sugar has dissolved. Bring to the boil and continue to cook until the mixture turns a deep amber colour. Reduce the heat to low and quickly whisk in the bicarbonate of soda. Make sure the mixture is combined but don’t overwhisk or the bubbles will start to collapse in on themselves. Pour into the prepared tray and leave to set at room temperature for about two hours before bashing into bite-sized pieces. 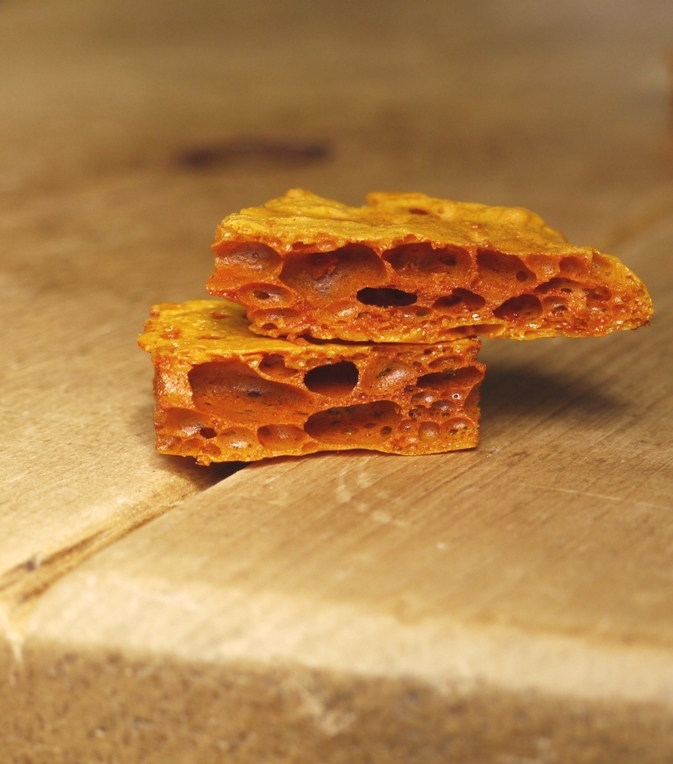 The bicarb is a necessary evil to get the honeycomb texture but you do have to be careful that it doesn’t drown out the lovely sweet flavours. A good stir works best. We made honeycomb at school as a science experiment, it was the only time I enjoyed science 🙂 I don’t think I have made it since but it is back on my to do list ! Lovely – looks great! this stuff is asking to be put in some ice cream or sprinkled atop a cheesecake! I made some honeycomb recently too! I used to make it as a kid, back when kids were allowed to do dangerous things. 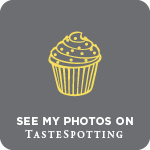 Lovely post, I am not a fan of the crunchie as a rule, but this looks divine. However I approve of your curly wurly choice immensely! By far my favourite selection box treat. 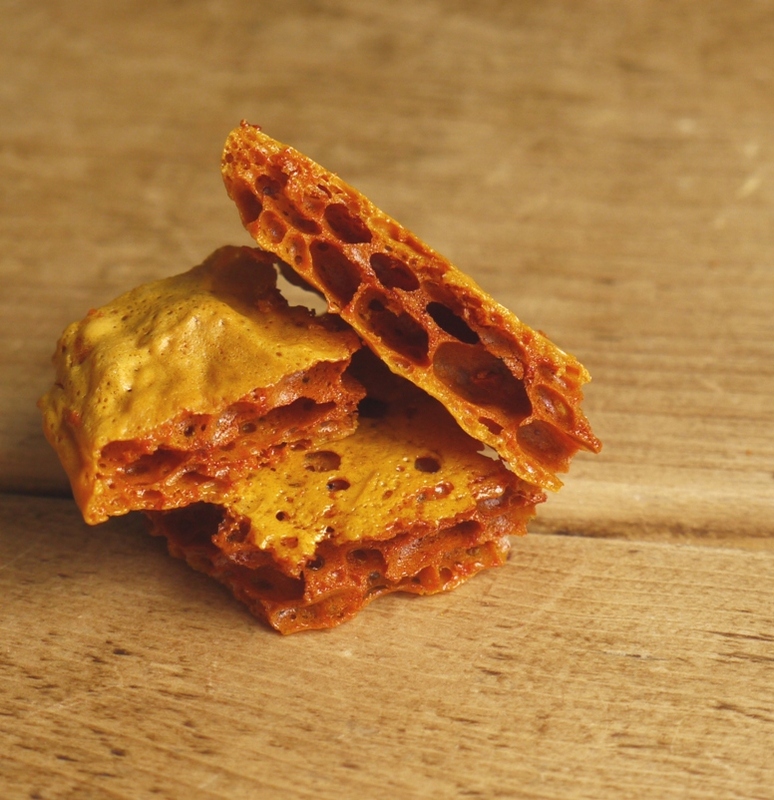 I’ve never heard of honeycomb before…it looks so delicious and satisfyingly crunchy! 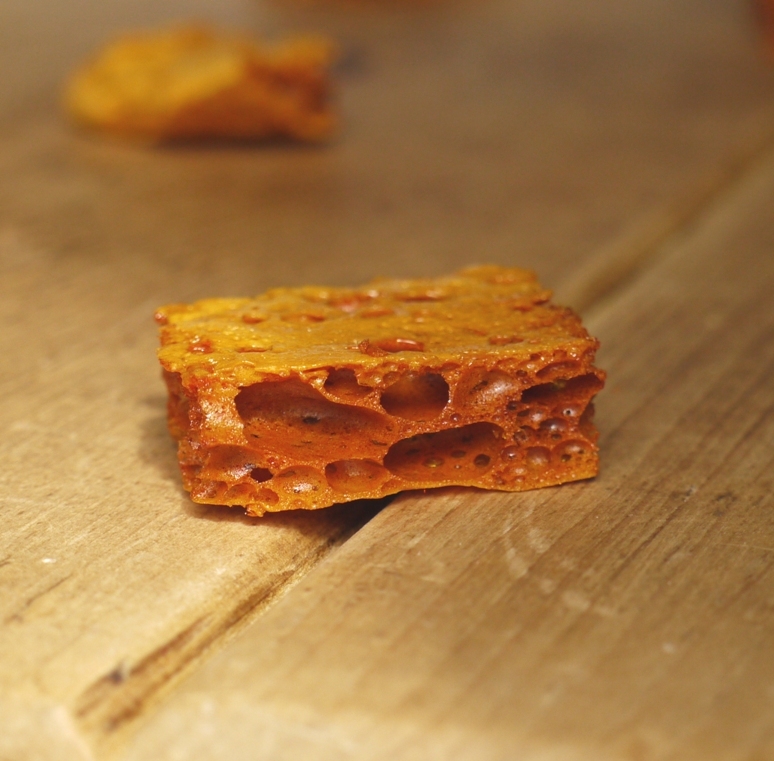 Making honeycomb is one of my absolute favourite things – I love that fizz when you add the bicarb! I’ve never tried it with honey though, definitely going to give this a try! Fab! You specify a ‘small baking tray’. What are the dimensions of the one you used? Thanks. To be honest, it doesn’t matter too much, but maybe a rectangular tray about 30cm long? I’ve made it in a lasagne dish too which works well – just make sure to line with greaseproof paper carefully as the honeycomb has a tendency to stick! Now this will be a fun project with the little one! Thank you for the brilliant idea. Just be careful when adding the bicarb – the hot caramel does bubble up a bit! 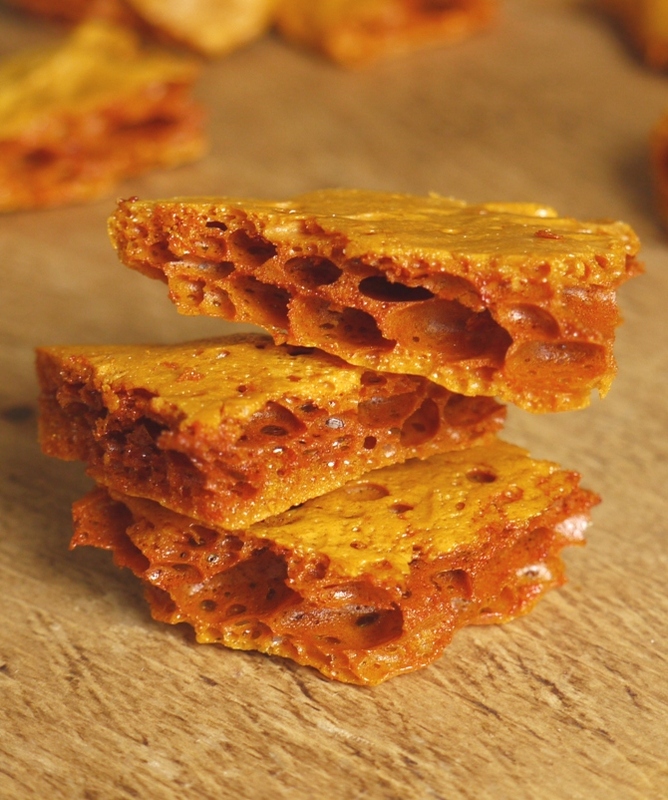 I’ve never thought about making homemade honeycomb before! This sounds fun. Thanks for sharing! I’ve always wanted to make honeycomb; your post and photos are sure an inspiration! Oh look how beautiful they are! Like really good bread with all those pockets of air. Sounds like a fun candy to make (carefully) with my little one. My house never had many chocolates either, and there were things I used to dream with, out of deprivation, jaja! I´ve been meaning to make honeycomb for the longest time. Thanks for this recipe Kate! you’re so talented, this looks gorgeous! 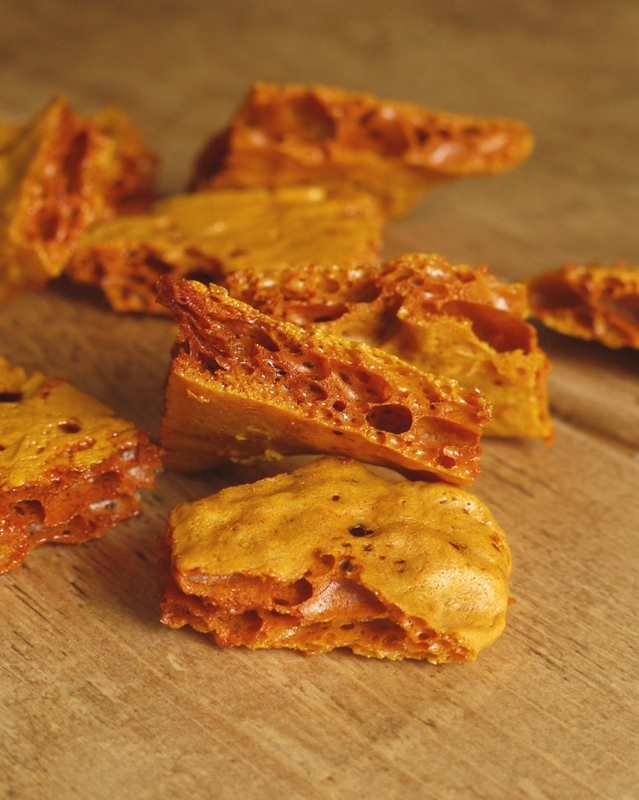 honeycomb is usually too sweet for me in a candybar, but I think this could find its way onto cake as a sort of crunchy topping! I always loved the crunchies in my Christmas Selection box and would save it until last. I’ve yet to attempt making it myself though. These look delicious. Gorgeous! I have always loved honeycomb but never bothered to make it myself but now you’ve really made me want to… I’m craving some! It’s so simple to make and you can make it darker and more caramelized or lighter and sweeter exactly to your taste which is a bonus! What a coincidence, I made this with my daughter last week but without great success – it whooshed up and looked perfect initially but very quickly slumped in the tin and went very chewy – literally enough to pull fillings out. It needs to shatter into gold dust like a Crunchie bar and ours didn’t. I will try yours! I think it can be quite temperamental. The trick is to mix the bicarb in well, but not so much that it bubbles too much and then deflates. Also getting the caramel nice and dark helps. Hope this recipe works for you – do let me know how you get on! Oh yes those fudge bars are small but tasty aren’t they? It’s been too long since I’ve had a good piece of Honeycomb! Your honeycomb looks fantastic! I’m a sucker for homemade honeycomb. So much better than the synthetic stuff found in crunchies. My grandmother loves honeycomb. It would be great to make this for her one day—especially after all the work you put into the recipe.